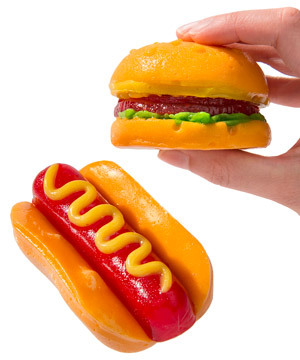 Gummy Fast Food: Hot dog and cheeseburger made of gummy. Grab your gummy to go and feast on candy versions of classic American foods. 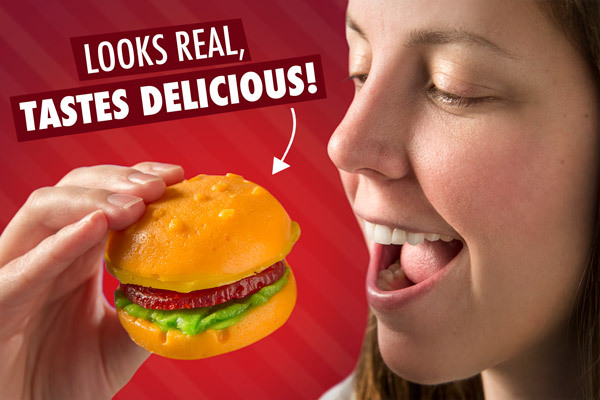 Gummy Fast Food recreates your favorite drive-thru snacks using nothing but gummy. Each treat has the shape, color, and detail of the original food without the meat or grease flavors. 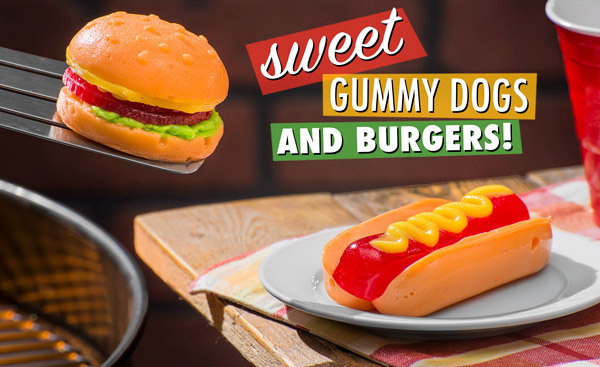 Chow down on either a yummy gummy hotdog or a slider-sized gummy burger, each rendered with layers of delicious fruit flavors. Grab both and have a fruity fast food feast! 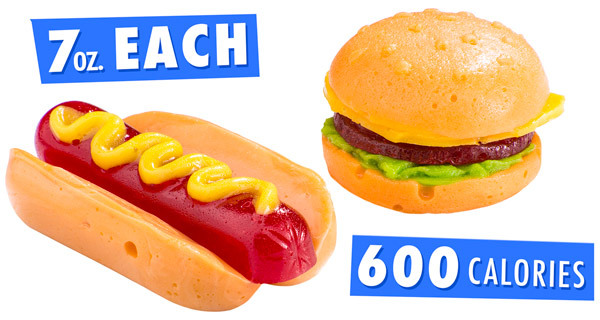 Bite into a burger or hotdog made just how you like it: with nothing but gummy. Gummy Fast Food is a candied homage to on-the-go staples, and it's as fun as it is delicious. The gummy treats are impressively styled to look like the real deal, down to the sesame seed outlines on top of the hamburger bun. The meat, buns, and condiments of these detailed snacks all have separate fruit flavors so each bite is like a gummy variety platter. When it comes to Gummy Fast Food, there’s no bad choice on the menu. If you’re in the mood for a ballpark treat, order yourself a cherry gummy hot dog nestled between an orange gummy bun and topped with tasty lemon mustard. 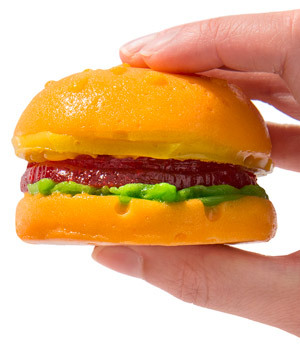 If you’re craving a classic diner dish, sink your teeth into a gummy burger with a cherry patty, orange bun, lemon cheese, and sour apple lettuce. Gummy Fast Food is great for those hectic days when you don’t have time to sit down to a jumbo meal but still want a healthy dose of deliciously unhealthy candy. Each style of Gummy Fast Food is nearly half a pound of tasty gummy so your belly will still be bursting. Fittingly, the gummy versions of these Americana classics are made right here in the U, S of A. Both selections are on the value menu. Question: Do they have the texture or taste of the original food? Answer: Gummy Fast Food is nothin’ but gummy goodness, with none of the flavors or textures of the food they represent. Simply put, they taste like candy! Question: So what’s in ‘em? Answer: Like all of our delicious gummy products, the ingredients are: Corn Syrup, Sugar, Gelatin, Citric Acid, Sorbitol, Natural & Artificial Flavors, FD&C Red #40, Vegetable Oil, Carnauba Wax, Canola Oil, Lecithin from Soybeans, Water, Rosemary Extract. 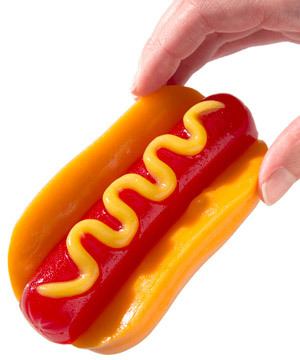 Question: How many Gummy Hot Dogs can you eat in 10 minutes? Answer: Check out the video below!